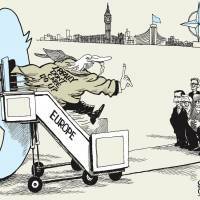 NATO can be viable with or without the U.S.
BERLIN - The North Atlantic Treaty Organization boasted on Twitter that the four World Cup semifinalists — France, the U.K., Belgium and Croatia — are members of the alliance. The U.S. failed to qualify for the tournament, so on the soccer field at least, the alliance can hold its own. But could the common defense pact survive without its dominant military power? Some military experts have asked that question since U.S. President Donald Trump’s election. Although he has repeatedly criticized European allies for not spending enough on defense (at least from the U.S. perspective), Trump is very unlikely to announce a pullout at the organization’s summit on July 11-12. Extricating the U.S. would take more time than Trump has in the White House, and it would probably be blocked by Congress. Moreover, Europeans don’t want the U.S. out. But maybe they should call his bluff, if only to drive home that the protection the U.S. is supposedly providing isn’t as vital as Trump appears to believe. NATO’s capabilities (at least on paper) would be sufficient to fulfill its mission of resolving regional crises and deterring Russia, even without the U.S.
Last year, according to NATO, the European allies had 1.78 million military personnel, compared with the U.S.’ 1.3 million. Russia has about 1 million active personnel. Mobilizations could change this balance, but NATO Europe, with almost 7,000 main battle tanks, 2,612 combat-capable aircraft and 382 attack helicopters, would be able to stand up to Russia in a full-scale conflict. France and the United Kingdom both possess aircraft carriers; Russia only has one. The U.K. and France have much smaller nuclear deterrents than the U.S., but it’s still sufficient to hold back a potential attacker. According to the U.K. government, France has up to 300 operational nuclear warheads and the U.K. a further 120. That’s not very many compared with the U.S.’ 4,000 or Russia’s 4,300, but France alone is a bigger nuclear power than China, which has 270 warheads. The U.K. and France don’t lack for delivery capabilities, either. Together, they contribute about 30 percent of NATO’s total ballistic missile submarine fleet. European NATO members can also hold their own in military expenditures. Even though last year they only spent about 36 percent as much as the U.S. on defense, their total outlays were higher than China’s, and dwarfed those of other military powers. Of course, much of the European expenditure is wasted on maintaining 28 separate defense establishments, 28 overlapping support structures and too many different types of weaponry. But today’s waste is tomorrow’s potential for increasing efficiency. If the U.S. somehow became inactive in NATO, European countries would be both freed and forced to pursue closer cooperation, which would streamline their joint forces and release enormous resources that could be invested more meaningfully than today. Even now, though, European armed forces aren’t useless or underused compared with the U.S. military. According to a new report from the Center for Strategic and International Studies, nine European countries made a greater share of their military personnel available for the global fight against the Islamic State group than the U.S.
All or most European NATO countries provide a greater relative share of their manpower to United Nations peacekeeping operations, the joint presence in NATO border states and the Kosovo force. Considering that these countries have more service members combined than the U.S., this means greater absolute numbers, too. Still, without U.S. military capabilities, even NATO operations that have involved Europeans to a greater extent than the U.S., such as the Libya campaign in 2011, would have required more time, more planning and more risk-taking. They wouldn’t have been impossible, though. And without U.S. pressure, the Europeans would only intervene where the European Union’s interests took them, not in quagmires like Afghanistan or in places that required no intervention, such as Iraq. There might be more resources available for operations such as Sea Guardian, in which NATO vessels patrol the Mediterranean and help the EU fight people-trafficking and smuggling. Without its European allies, the U.S., for its part, would need to rethink its power projection in distant parts of the world. In Afghanistan in 2011, the European allies contributed 38,000 troops, almost half as many as the U.S. Without that help, the U.S. would have spent tens of billions of dollars more on its Middle Eastern operations. Perhaps Trump sees an isolationist policy as the U.S.’s future and the savings made possible by the European allies aren’t part of the calculus. Defeating IS, however, was one of his key election promises, and, according to the Atlantic Council, non-U.S. anti-IS coalition partners have flown about one-third of all strike missions in that campaign. The U.S. remains the world’s foremost military power, but its European allies shouldn’t be shy about questioning Trump’s bluster. 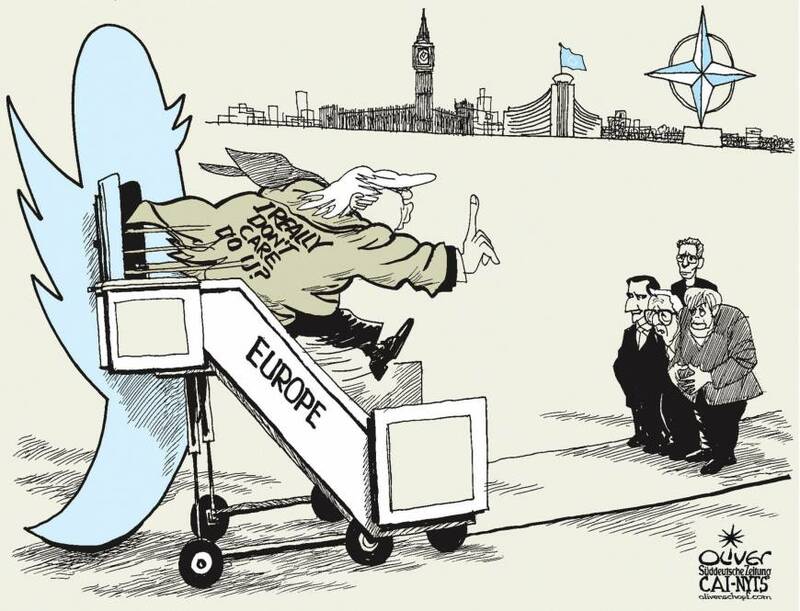 On Monday, he tweeted that “NATO benefits Europe far more than it does the U.S.” Well, it could keep benefiting Europe without the U.S., too, removing the need to build parallel military structures as the EU has recently started doing with full support from France and Germany. For many years, the U.S. has demanded greater European financial contributions to NATO, and European leaders have done little. Yet the alliance hasn’t fallen apart, perhaps because previous U.S. leaders have been reluctant to push the issue. Trump may not be so reticent: He’s supremely confident in his ability to beat allies into submission. But that doesn’t mean the allies shouldn’t respond as they have in the past. The U.S. needs them as much as they need the U.S., and in a pinch, they could take care of their own security, even if that would be scary at first. Based in Berlin, Russian writer Leonid Bershidsky is a Bloomberg Opinion columnist.